Benchmade knives are often the gateway drug to the upper end of folding knives, and the Benchmade Griptilian is the gateway drug to Benchmade knives. For many, their first handling of the Griptilian is met with disappointment. The Griptilian, although a solid knife, does not have the heft and density often expected as the retail price goes north of $100. In reality a few minutes of use tells a different tale, but the lightweight and nimble mechanics of the Griptilian attest to its popularity. 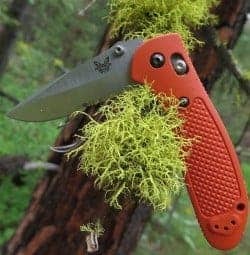 There are several primary choices with the Griptilian including size (regular and mini), blade shape (drop point or tanto), steel choice (154CM or S30V), and color of scales (black and orange are popular but there are many other colors). From here the choices just continue including handle materials, blade coating, and edge serrations. In Benchmade parlance, each knife model is designated by a number that may or may not ever make sense. The Griptilian family of knives will be variations of 55x from 550 to 557. What all Griptillians have in common is Benchmade quality and their famous Axis Locking mechanism. For those unfamiliar with the Axis Lock, it is a dual-sided lever bar that slides parallel to a deployed blade. The spring loaded lock is retracted away from the blade allowing the blade to swing freely. With the blade stored, the Axis Lock provides enough resistance to keep the blade in place, but easily lifted out of the handle as desired. However, with the blade extended, the bar of the Axis Lock snaps over a shelf in the blade back securing it to the point it will not fail under normal use, and even a considerable amount of abnormal use. Even better, the Axis Lock can be used in conjunction with a minor wrist flip that deploys the blade with a very satisfying snap. After a few practice flips learning to coordinate the Axis Lock retraction and the wrist flip, the Griptilian can go from pocket to action in one clean fast move. Oddly, there is a Griptilian blade style called a Sheepsfoot containing a deployment hole like a Spyderco knife. Personally, I have no need for such a hole with the effectiveness of the Axis Lock. 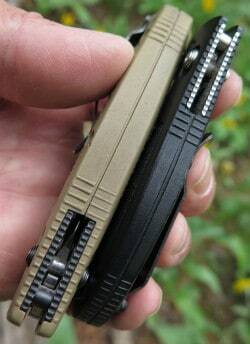 Even so, the other Axis Lock versions have thumb studs for a less overt blade opening. And speaking of overt, sometimes carrying an orange handled knife looks much less aggressive than a black or FDE colored handle. 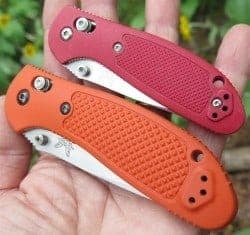 With a healthy 3.5 inch blade on the regular sized Griptilian and a just under three inch blade on the Mini, the handle color might affect the attitude of those around you when whipping out your EDC blade at the office. 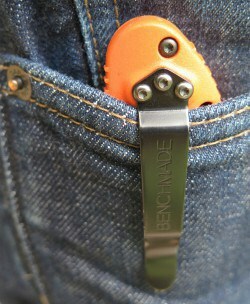 The company Benchmade offers some services to its customers after the sale. One in particular is what Benchmade calls their LifeSharp program. At any time, you can mail your Benchmade knife to the company and they will professionally sharpen it and replace any normal wear and tear on the mechanism, springs, screws, bolts, and replace the pocket clip if needed. More work can be done at a minimal cost including replacing the blade. There is no charge beyond the one-way postage to Benchmade headquarters in Oregon. I’ve used the LifeSharp service many times with many knives, both fixed blade and folding. It always over delivers. The old saying that two is one and one is none is based on the most likely reasons gear won’t work; loss and failure. The problem with doubling up due to anticipated loss is that many feel prepared by having two half-quality items rather than one full-quality tool. And failure might be closer than it appears since simple tasks under a blue sky take little sophistication for a knife. But once the difficulties start to compound, two 50% quality knives can never add up to more than 50% quality. Enter the Benchmade Griptilian, a high quality tool that plays with the big boys, but has a price point closer to the usual suspects. The features of the Griptilian line include a rock-solid blade pivot and locking mechanism, and excellent form-fitting handles of durable and replaceable material. But best of all, a high quality Benchmade steel capable of more than most. Benchmade’s house steel of 154CM is an excellent steel, and easily makes the cut into the realm of so-called “Super Steels.” But there are other options available both at point of purchase, and later should you want to upgrade your Griptilian. So don’t let the light weight and pretty colors steer you away from the Benchmade Griptilian. It might be cheap for a Benchmade, but its every bit a Benchmade.